Looking out at the lake in Queenstown. Today was, without a doubt, my favorite day in New Zealand. It can all be summed up in one word. What a difference a few rays of light can have on my opinion of an entire country. We finally saw a lake that made our mouths drop. going to volunteer this information to her. times that lavender was present). I never knew this existed in New Zealand. while I was in this neck of the woods. 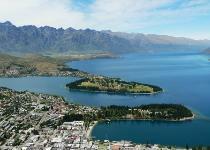 But the time finally came when we hit our destination – Queenstown. were actually people and things to do. It is beautiful here – it almost reminds me of a ski resort town but on a slightly larger scale. seats – it was impossible to not have a good time. I was actually expecting it to give me more of an adrenalin rush that it did. Nevertheless, it was really fun. I told the guy (whose name I had still never learned) that it was time for us to break up. expectations…because I have a good feeling it will. to start the day, huh? But the main attraction for the day would come at 1:30pm when the van would pick me up to take me to the top of a mountain. going to keep me and the professional in mid-air. Was I concerned? Not in the slightest. try to run in sync with each other. Aside from being told where to put my hands, I really wasn’t told much else. of steel but I am getting a bit concerned about myself seeing that I was not the least bit nervous before running off of the cliff. just stayed focuses and warned me about worse turbulence that was most likely going to take place on our descent for the landing. the feeling. All I know is that I would do this again in a split second. Hour and then started bouncing around different bars around town. Yesterday Jim and I made a bet. He told me there was no way I could go one day without asking a waiter/waitress a question (e.g. ‘What wine would you recommend?’, ‘What is on the antipasto platter?’, ‘Which of these two things would you recommend?’, etc.). very slight exaggeration) as there were cafes in teeny-weeny towns where I just ordered an item off the menu – no questions asked. I was aware of this bet before meeting up with him and I knew I was going to win. get me a glass of ‘the pinot noir that she liked the best’. winning the second time around and didn’t owe him anything. swear off miracle workers such as Advil, Tylenol and Aleve. That must make for some cranky individuals. me the ammunition to laugh at him. He seems to be secure enough in his masculinity to take it. Props to him for that. The time came this morning to take Jim to the airport to send him back to America. Jim moved from San Francisco to New York. One day in particular it seemed like he was more intent on being crass than being funny. if it was just us…but there was an older couple sitting just inches away from us and I knew that they could hear what he was saying. endure this on my own? Would I be able to??? Needless to say, I was a bit nervous about how five days alone with him was going to be once Kat left. was no need for me to be concerned about my five days with him. region of the world. I knew I had to try more when I was on my way out of Queenstown. happen but I was better off still being questionable. was donning a goatee. Not my favorite look on a guy…but on him I would take it. New Zealand – there is no time to write much more than necessary information - whether it’s to family, friends or former flings. Zealand). This time it was ‘Good-bye’. decided it was worth the detour. landscape consisting of desert, vineyards, cypress trees, a lake, etc. splurged on a bottle and am just praying that it gets home in one piece. View of Queenstown from up above. Soaring over the skies while hang-gliding.